We used to have these DIY tree stump tables next to the chair. But, then I moved them into the bedroom because I liked how they looked next to a wicker chair. I really liked the height of the tree stumps next to the chair, they weren’t too large, which would block our walking area in that space. So, I decided to make us a side table (or two). These are heavily modeled after this Jonathan Adler table. I first saw this table in his home (in his book) and loved it! I actually thought it might be vintage at first, but of course it’s his own design. So pretty. Here’s how I made my tables. 1.) Supplies needed: three aluminum sheet metal (usually sold 3 ft x 2 ft), two wood rounds, wood stain, polyurethane, heavy-duty glue*. Not pictured: metal clippers, work gloves, embroidery thread, masking tape, scissors, spray paint primer, brass spray paint (or any color you prefer), sandpaper and RotoZip RotoSaw+. 2.) Cut your metal sheets to your desired height. For the larger of my two tables I needed two metal sheets, so if you are creating a larger side table be sure to cut two sheets the same height. Always wear work gloves when working with metal-it’s sharp stuff! Try to cut along the top edge of the design, so you can avoid having jagged edges. 3.) Use the embroidery thread to securely tie the metal sheets into rounds. Similar to this tutorial. Use a neutral colored thread. But we will be painting this later so it doesn’t have to match perfectly. I taped one edge of my thread as I worked, this helped me thread it in and out for the metal sheet more easily. 4. Prime the metal table base. Be sure to get the inside and outside. Once dry (check your bottle for dry times) spray with your desired color. I choose a brassy gold color, but you could also do a brighter gold, color or even leave it white. 5.) Sand your wood rounds so they feel super smooth to the touch. Stain them with whatever color you choose and allow to fully dry. Check the container for dry times. Then coat with polyurethane. 6.) Place the metal base (cut side down) on to the wood round. Trace a circle around where the metal hits. I used a RotoZip RotoSaw+ to cut a groove over this line. Squeeze a little crazy glue* into the cut, then fit your metal base into the cut. This is easier done with a partner (thanks Elsie!). *I had originally planned to use J.B. Weld glue as it was recommended to me while I was buying supplies at the hardware store. Once I started using it I found it was too goopy to cleanly get into the cut groove. So, I instead used crazy glue. These are GORGEOUS! Such a brilliant idea, I love furniture that looks like this- amazing! What the clever?? I love this!!! And i’m still so OBSESSED with your hexagon table peeking out from the background. DYING! Wow, pretty cool stuff. Thanks for sharing… I just might have to make these… good job! Oh my goodness I absolutely love these!!! Great job. SO clever! they would look beautiful in a copper/gold as well. I loooove these! I’m not usually that handy but these look totally doable, and I think I need some in my living room now! That’s beautiful. Keeping this is mind for when I get a permanent place! I absolutely love this!!! I’ve been searching for cool side tables that aren’t expensive (almost impossible). We just moved into a place in December, so we took what we could get from friends and now that we’re (somewhat) settled, we’re looking to find something that goes more with our taste. These are so awesome!! p.s. LOVING “The Interestings”! Can’t wait to talk about it at the end of the month! These look great! This is one of my favorite projects you have posted in a while, Great job Emma! They look fantastic. Oww that chair!! It’s the best! Where did you get it? I love the brass combined with the wood, it looks great! Oh my gosh! I’m in LOVE! 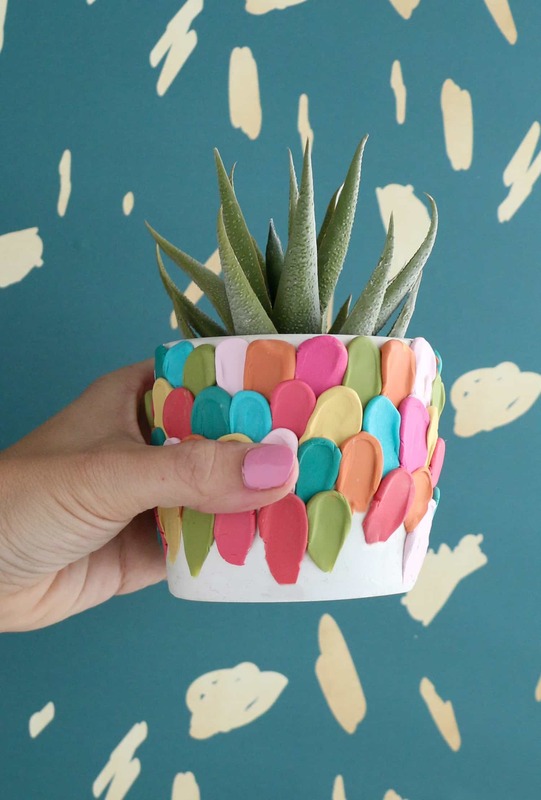 This might be my favorite DIY project you’ve ever done before. Love love love! Beautiful! I love how unique they look, without being too crazy or flashy. They are just little gems that fit right into your space. Love. any way to connect the top to the metal without a RotoZip RotoSaw? I don’t have any tools like that. And approx. how much would these cost to make? thanks! These are actually really awesome! They look so professionally done and can be used for a long time to come. Just a great DIY. LOVE these! We just purchased a futon as a spare sofa/sleeping area and these would be perfect next to it. I totally dig these! If I make them I’ll put books under them to keep them out of sight/just enough in sight! These look brilliant. They would look great in bright colours aswell. I’ll be honest… one of the best parts of this post is the pup’s “whatchu talking’ bout, Willis?” face. Pure gold. And LOVE the tables! My husband & I are redesigning our office and I imagine I’ll do all white. 🙂 Thanks for the beautiful work! I’d love to see how these hold up. These look like just the table I need for our bedroom! Thanks for the great idea Emma! Um, these are AMAZING. I am currently decluttering my space but then I want to fill it with individual, cute furniture that I plan on keeping for a long time. This may have to be included. It’s from Thrive. I love the blue! you both are just too cool. you inspire me to make tables and chairs and a bunch of other things for my home with my fiance when we get married in july. thanks for always inspiring me! You clever clever lady! Those look so good. We have a neat mid-century round glass and teak coffee table and the best part about it is that there are 3 little tables that nest perfectly underneath it, but that are separate and can be used as needed. So handy to have little tables to put your stuff on! This is so awesome and definitely something I would love to replicate! Were you able to pick up wood rounds at the hardware store as well? Me too! I never would have picked it out on my own, so thank you! 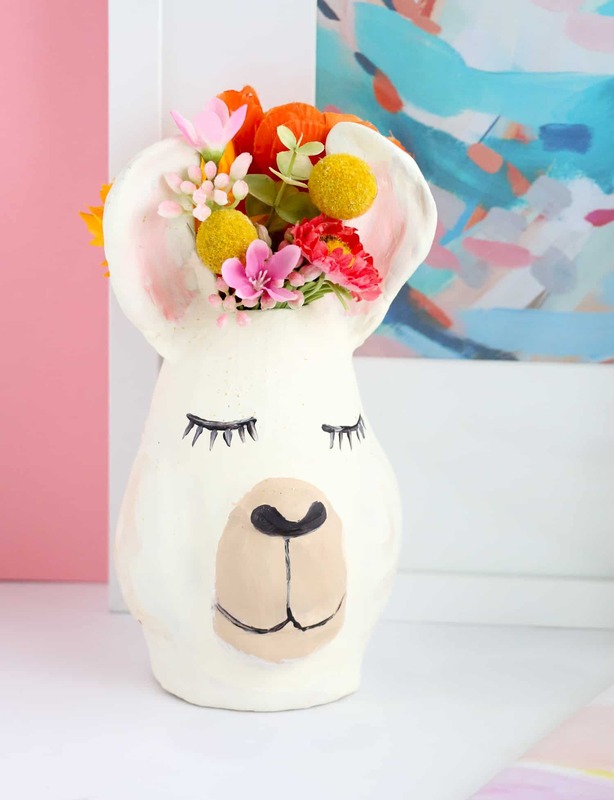 These are super adorable and perfect for the little space we have next to our couch. Do these feel sturdy enough when they’re done to leave a lamp or heavy dinner plate on? Can’t wait to make some tables like this for my house! What a fantastic idea – thanks for sharing your talents! These are so funky / industrial-style. Cool idea! These are most definitely better than the Jonathan Adler tables. You did great! I might just have to try these once I have room for side tables. Oh tiny apartment living. Thanks for all the inspiration! Lovely tables, i love the openwork in metal and combination with wood is so nice! These are cool! I would paint them white with a neon top, or something dramatic like that! These are great! I wonder what they would look like with a hidden light in them. If it might look like a giant decorative lantern. These are amazing! I can’t believe you made them yourself. I definitely want to try it out. These are gorgeous – what an amazingly simple idea! These little tables look absolutely cute! Your imagination has no limits! these are amazing, I love the modern/ethnic feel to them perfect for my home! i might have to have a dabble with making some. Brilliant idea! I always eye that metal screen stuff at the hardware store, but could never figure something cool to do with it. I was a little concerned about this too, as our three dogs tend to knock lots of things of coffee tables and what not. So far (this week) they haven’t fallen over. They are more secure than they appear. That being said, they are not the sturdiest side tables ever. And the metal sheets could be a problem with little fingers. Just a thought. Yes, I bought mine from Lowe’s. I believe they have them at Home Depot and probably many locally owned hardware stores that carry lumber. If you aren’t sure I’d call ahead before making the trek. I bought it at Lowes. Actually, all the supplies for this particular project where purchased at Lowes. Hmm… I’m not sure what else might be a good tool to create the groove in the top wood. My rotozip rotosaw only cost about $90. But, I plan to use it may times over the years as I love making projects out of wood. So, if you wouldn’t use it it might not be worth the investment. The entire project (not including the saw) cost around $150. But supply cost may vary some depending where you get your supplies. I love these! They don’t look DIY-ed at all! Great accent piece. I love this idea. Where can I find the wood rounds and metal sheets? +1 on the chair! Where is it from? Great job! I’m not too sure if this was asked already but what stain are you using for the wood? I have a lot of DIY wood projects going on and I’m always on the look out for a good looking stain. This one looks fantastic! They’re really cute. Your instructions leave me with lots of questions, like where are you getting the metal, wood rounds, how much did supplies cost? These are great! Where did you get the sheet metal from? I’d like to try this project, thanks. I’m really so amazed by your creativity and patience to do this! The tables are beautiful and it’s been inspiring to see how to do them! Love the tables .. they look sort of Mediterranean!!! also the plastic chairs in the background look so unique..waiting to hear about them!! Very cute! At Christmas you could put a little tree with lights in the base — a little trick from my mom! I would love to do a shorter version as a possible cocktail table. Where did you get the wooden rounds from? I would need a much bigger one.